We all know how stressful this time of year can be, but when you care for a seriously ill, injured or disabled child, the extra expenses involved make it very difficult to provide a warm, enchanted holiday you dream of for your children. The families we reach through our Holiday Adopt-a-Family Program have children who are suffering from a variety of conditions including cancer, cerebral palsy, cystic fibrosis, sickle cell anemia, severe disabilities or serious injuries. These families are under immense financial strain and are brought to our attention by social work departments in hospitals and social service agencies. You are welcome to state your preference, for example: A small family with 1-2 kids or a large family with 5 kids; and we will try to accommodate you. We try to get all the families assigned before Thanksgiving, so sponsors can take advantage of Black Friday and Cyber Monday sales. Most sponsors spend approximately $75-$100 per child, depending on age. You will receive the names, ages and gift suggestions for the family members you are sponsoring. 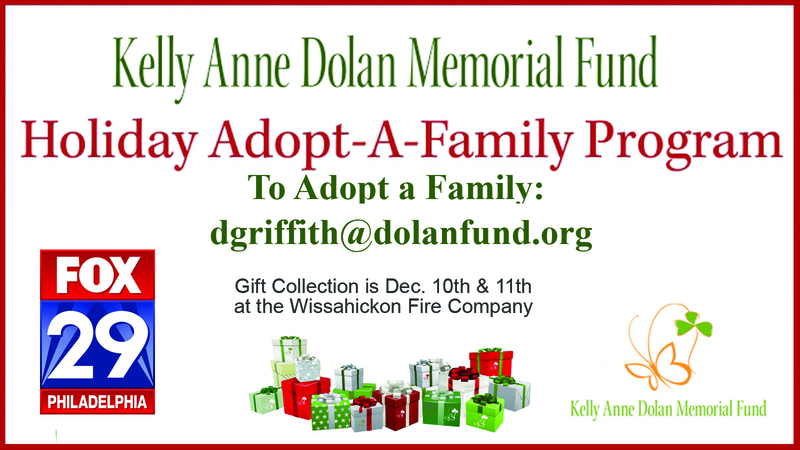 We will collect gifts at the Wissahickon Fire Company on December 10th and 11th. If you are unable to sponsor a family but would still like to help, we welcome monetary donations or gift cards. We often receive requests for help just days before the holiday and gift cards are the perfect solution to a last minute problem. Anything you do will be greatly appreciated! Last year, through the kindness and compassion of people, our program distributed gifts of clothing, toys, household goods, food baskets and gift cards to families! We like to help even more families this year. If you want to join us and sponsor a family or help out in another way, please contact Danielle Griffith (dgriffith@dolanfund.org) at your convenience. Or... let us do the shopping for you! Just select one of the "Sponsor a Child" options on the right.